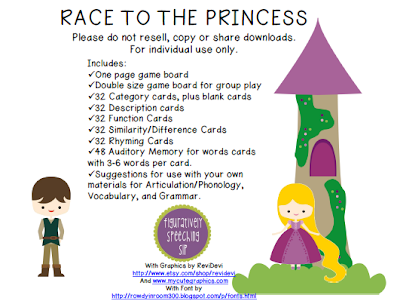 Product Review: Race to the Princess Language Game! This week I am reviewing a great new product created by, Figurately Speeching SLP. 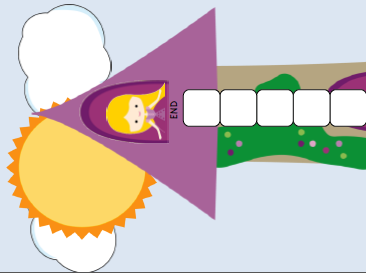 There is a very sizable game board, print multiples and each student can race to the top to rescue the princess! She has a smaller version of the board game available for free HERE. Look at the description! You can see there are multiple different language tasks in one packet. I specifically like this product because I have many students working on their semantic skills! This is a great packet to target vocabulary building in various different ways. I think working with groups this would be helpful because you can use the same game board, but target different tasks using the various cards included. Why do I LOVE this packet? She included categories, functions, descriptions, similarities/differences, rhyming and auditory memory tasks all in one packet! Talk about a bargain! Originally priced at $5.00 and on sale for $3.50! The graphics are adorable, I love the large game board. The cards are comprehensive, well thought out and organized. If you like this Race to the Princess Game, Figuratively Speeching SLP has other great products in her store. Check them out HERE Don't forget to follow her on TpT and Facebook!